Big waste dog, nimble, never clumsy, vigorous appearance. The body is rectangular, with a broad croup that is slightly inclined. It is vast and high-chested, and has a long and slightly inclined shoulder. The sexual dimorphism is well noticed; the males should be taller and stronger than the females. 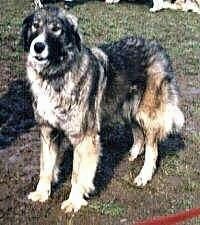 The Carpathian Shepherd Dog is a mesocephalic dog, with a strong, wolfish type head, but not clumsy. The forehead is broad and slightly curved. The skull is wider between the ears and it narrows progressively toward the stop. The medial groove is long enough and sufficiently marked. The nose is big, broad and always black. The muzzle is strong, with an almost oval section, slightly in the shape of a truncated cone. The muzzle’s length is shorter or equal to that of the skull. The lips are thick, adherent, strongly pigmented and very well outlined. The dark brown eyes are almond shaped. The tail is bushy, covered by abundant hair. At rest, it is held dropped, straight or slightly sword shaped, touching the hocks; when the dog is alert or it is in action, the tail is carried high. The coat is rough, abundant and straight. The undercoat is dense and soft. Except for the head and former faces of the limbs where the hair is short and flat, the hair is abundant all over the body, of a medium length. On the neck, the posterior face of the limbs and on the tail, the hair is longer; the abundance of hair in these regions being typical. Coat colors consist of sandy (wolfish), with various shades, more often lighter on the sides and darker over the body; sandy (wolfish) with white spots, preferably not too spread apart. Born as a watchdog, the Carpathian Sheepdog is remarkable for its instinctive, unconditioned devotion to the flocks and its master. It is a dignified, calm and well-balanced dog. In order to successfully keep a Carpatin, the family must achieve pack leader status. It is a natural instinct for a dog to have an order in their pack. When we humans live with dogs, we become their pack. The entire pack cooperates under a single leader; lines are clearly defined and rules are set. Because a dog communicates his displeasure with growling and eventually biting, all other humans MUST be higher up in the order than the dog. The humans must be the ones making the decisions, not the dogs. That is the only way your relationship with your dog can be a complete success. However, the general appearance is most important. Weight: proportional to the waist, giving the impression of a strong but not heavy dog. The Carpatin is not recommended for apartment life. It has an all-weather coat and will be content to live and sleep outdoors. His character demands an outdoor life. This breed needs physical exercise and should be taken for a daily, long walk. In addition, it should have a yard or large space where it can safely run free. 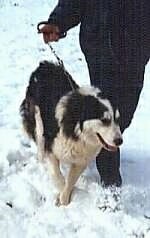 This breed originated from Romania. 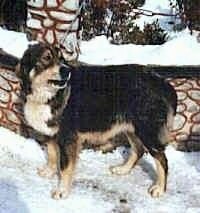 It is an excellent flock guard dog used for centuries by Romanian shepherds and a wonderful watchdog. 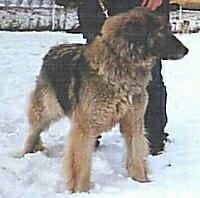 The Carpathian Shepherd Dog was selected out of an endemic breed that exists in the Carpathians and the Danube area. For centuries, the main reason was its utility; this breed kept its features untouched up to now. The first standard was elaborated by The National Zootechnical Institute in 1934 and was modified and updated in 1982, 1999 and 2001 by The Asociatia Chinologica Romana (Romanian Kennel Club (RKC)). The technical commission of Asociatia Chinologica Romana (RKC) adapted the standard on March 30, 2002, according to the pattern made by The Federation Cynologique Internationale. Bongo, Carpathian Shepherd dog at 5 years old—"He is a very loving, well-behaved and protective dog!"